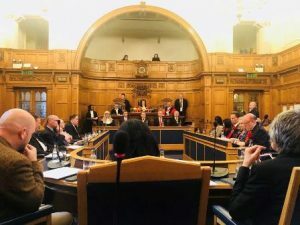 Emdad Rahman : Improving equality, inclusion and supporting Croydon’s communities are the priorities of the borough’s new mayor and the deputy mayor as both were sworn in for their respective offices in the Croydon Council’s latest AGM. 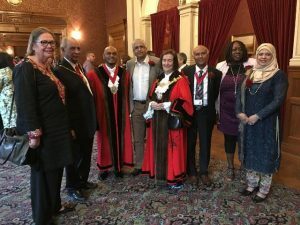 Liverpudlian Councillor Bernadette Khan, who represents West Thornton ward, and Councillor Humayun Kabir who represents Bensham Manor Ward have pledged to encourage local residents of all backgrounds, businesses and institutions to work more closely together and promote equal opportunities for all. A social worker by training, Councillor Khan lived in Pakistan for three years before settling in London in 1965. She moved to Croydon in 1976, working for Wandsworth Council in specialisms including fostering, adoption and child protection. Her career has also included co-founding a foster parent association in Lambeth and working as a magistrate in both family and adult courts. Councillor Kabir is currently an advisor of the Bangladesh British Society of Croydon (BBSC). Councillor Kabir moved to Croydon in 1978 and got involved in various businesses to support his native Bangladeshi community. He was voted in as chair of the Surrey Bangladeshi Welfare Association as well as the president of Bangladesh Welfare Association of Croydon. In his daily profession, Councillor Kabir was appointed as a family advisor in 1992 and has managed a team to provide adequate parenting support in Tower Hamlets Council. The married father-of-three, who sat on the steering committee that led to the development of the Shah Jalal Mosque in Croydon, is also a former deputy cabinet member for both finance & treasury, economy and employment. Councillor Kabir was a founder member of the Asian Resources Centre of Croydon (ARCC) and served the organisation until becoming a councillor in 2010. He is continuing his services as a finance director in the management committee of Bensham Manor Community Association. Additional credits: Norbury Labour Party.